This is so simple, yet tastes delicious. 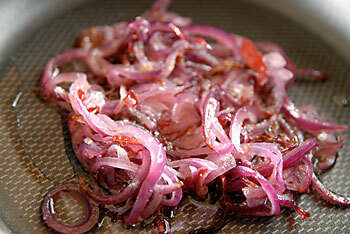 By using the red onions, it gets a red and green coloring. Clean the Brussels sprouts and cut them in half. Slice the red onions finely. Place the Brussels sprouts in a steamer and steam until al dente. Saute the onion in the olive oil until the onion becomes glassy. Pour the vegetable bouillon and wine over the red onions and allow the ingredients to mix and cook down to half the amount of liquid. Remove from the heat. Slice the apples finely into a bowl with a bit of lemon juice so that they keep their color. Place the Brussels sprouts in a serving bowl. Pour the onion, bouillon wine mixture over the sprouts and mix well. Add the apples and once again mix. A nice red apple would help this too, but the green looks so nice with the Brussels sprouts I chose the green Granny Smith apple. 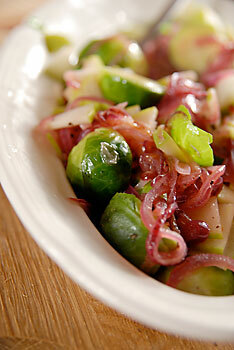 Posted by Chris Walker on December 10, 2007 in Apple, Brussels sprouts, Onion, Side Dishes.